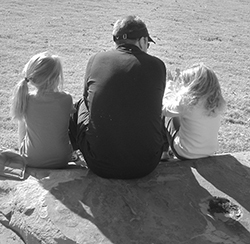 My dad didn’t go into detail about what he was sorry for … he didn’t need to. I knew. I remember. I remember walking across campus to my dad’s office everyday afterschool for over a decade. Upon my arrival, I would find my dad sitting at his desk surrounded by piles of papers and books. Although the empty chair sitting beside him was probably for a colleague in need of curriculum guidance or a college student seeking scheduling assistance, I always believed that empty chair was for me. Dad would look up from whatever he was doing and greet me with a smile. Then, as if on cue, he’d place the cap on the black felt-tip pen that he used to grade papers or draft notes. The pen cap gesture was my signal. It meant my dad wanted to hear about my day. Sometimes I told him a few things, other times I went on and on about something exciting or dramatic that happened at school. My dad would listen, nod, and sometimes add his two cents. Without fail, my dad would smile as if hearing about my day was the best part of his day. This was the routine. From first grade through my senior year in high school, I had afterschool chats with my dad. I can’t remember a time when he said he couldn’t talk right now, even when he was working on his dissertation, dealing with challenging faculty issues, or facing budget cuts. When I spoke, my dad was all there. My dad wasn’t perfect. He lost his temper sometimes. He worked too much. He experienced periods of depression. But even through the rough patches, my dad always listened to me. He was never too busy, too distracted, or too desolate to hear my thoughts and opinions. So despite what the critics say—that giving a child our undivided attention creates a child who thinks the world revolves around him or her—I believe otherwise: Having a parent that listens creates a child who believes he or she has a voice that matters in this world. When you believe your voice matters, you have the strength to say, “Let me out of the car.” You have the courage to say no to harmful substances that can impact your ability to make decisions and prematurely end your life. When you believe your voice matters, you have the confidence to stick up for someone who is being mistreated. You have the ability to admit you made a mistake and will try to do better next time. In the moments described above I could have suffered in silence, but I didn’t. Instead, I spoke up. Why? Because my dad listened to me as I grew. Tip: If your days are full and you cannot give your undivided attention whenever your child speaks, make sure there is a time of day when you can be all there. Maybe it is at bedtime or right afterschool. When my older daughter was three she began asking for “talk time” at night. It involved ten minutes of her asking innocent questions and telling me trivial things and me giving her my undivided attention. She is now twelve and we still have “talk time” every night. As one would expect, the questions and topics have become more serious, and I am grateful to be part of the conversation. When my children have something they want to tell the coach, the waiter, or the sales clerk, I first let them practice what they want to say and then they are encouraged to speak for themselves. I will never forget when we were sitting at my child’s fifth grade parent/teacher conference and the teacher asked if we had any concerns. My daughter quietly spoke up to say she loved helping her classmates but there was one student who made her feel very uncomfortable. The teacher said, “I hear you. I understand.” I was relieved that my child was able to express this feeling of unease in an effort to protect herself. I commend the teacher for validating my daughter’s feelings by her response. When my younger daughter was four, I could not locate my car in a mall parking lot and feared it had been stolen. She quickly pointed out that we were not in the right section and showed me the way. That night, I deemed her ‘The Parking Lot Expert’ and she beamed. She is nine now and still calls out, “Don’t worry, Mom! I remember where we parked!” She is also ‘The Name Expert’ in our family because she always remembers people’s names. I also designated her ‘The Music Expert’ because she knows how to tune and play her instruments, as well as sing out beautifully. Children soar when their gifts are affirmed and acknowledged. By letting them lead, it gives them confidence to voice their skills and wisdom. When children describe shocking information or confess to making a poor choice, take pause and try this response: “Thank you for trusting me with this. You did the right thing by telling me.” No matter how angry you are or how much you want to scold them, it can take just one volatile outburst to shut down future communications with your child. “Thank you for trusting me with this,” opens up both the discussion at hand and the discussions of the future. Think about who you want them to confide in when they are scared, hurt, or worried. If you want it to be you, muster all the grace you have and speak calmly in troubling times. As a parent you know how difficult this job can be. You know there will be days when you are dealing with heavy life issues. You know there will be days when nothing goes right. You know there will be days when smiles don’t come easily and harsh words are spoken too quickly. 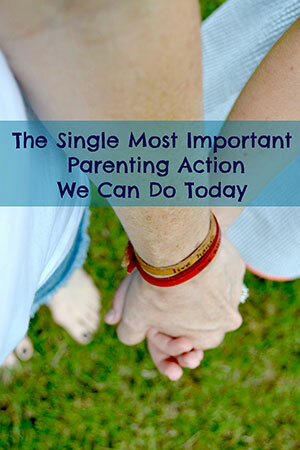 On those days, I urge you not to say, “I am a failure,“ or “I am a bad parent.” Instead, I urge you to garner the strength, patience, and resolve to do one thing: Listen. Listen with your eyes, ears, and heart. Because someday our children will find themselves in a difficult situation and they’ll have a choice—either to suffer in silence or speak up. And perhaps that is the moment they will remember your eyes, the nodding of your head, and your thoughtful response. And suddenly they will be reminded that their voice holds value. And when you believe your voice holds value, it can be a life changer. Rachel Macy Stafford is the founder of www.handsfreemama.com where she provides simple ways to let go of daily distraction and grasp what matters most in life. She is the New York Times bestselling author of HANDS FREE MAMA. Her highly anticipated book, HANDS FREE LIFE, releases on September 8! It is a book about living life, not managing, stressing, screaming, or barely getting through life. Through truthful story-telling and life-giving Habit Builders, Rachel shows us how to respond to our loved ones and ourselves with more love, more presence, and more grace. A note from Amy McCready… Rachel’s words beautifully remind us of all those things that truly matter when it comes to living a happier and more fulfilled life. Her call for us to unplug from our spinning-too-fast world is timely, poetic, passionate, and truly vital to our children, our partners, our families, friends – and ourselves. This book will be a staple in my home and I urge you to take advantage of her generous pre-order offer above and make it a staple in your home as well. Pick it up today – and I promise, you won’t want to put it down. 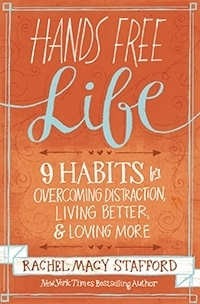 * A portion of this article is taken from Hands Free Life: 9 Habits for Overcoming Distraction, Living Better, & Loving More by Rachel Macy Stafford. Copyright © 2015 by Rachel Macy Stafford. Used by permission of Zondervan.